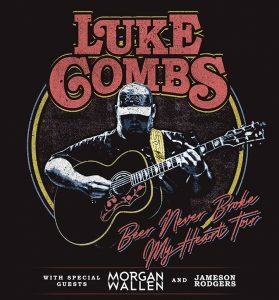 UNCASVILLE, CT (March 28, 2019) – CMA and ACM Award-winning musician, Luke Combs, will extend his sold-out “Beer Never Broke My Heart Tour” through this fall. The newly confirmed dates make a stop at Mohegan Sun Arena on Friday, November 22nd at 7:30pm. Special guests include Morgan Wallen and Jameson Rodgers.